Got eSports? 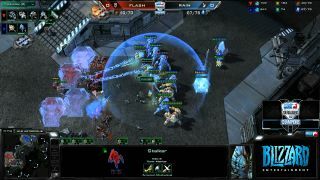 The competitive gaming scene has grown enormously in the last couple years, with PC titles like StarCraft II, League of Legends, and Dota 2 leading the charge. Many of you have probably already joined in the excitement and insanity, but if you haven't, I want to change your mind. All I ask is that you take a few minutes to watch our latest video, in which I Zerg rush the main reasons I keep hearing for why people haven't gotten into eSports. Too boring? Too complicated? Can't take it seriously? Prepare to defend the worker lines of your brain against some three-pronged drop harass.